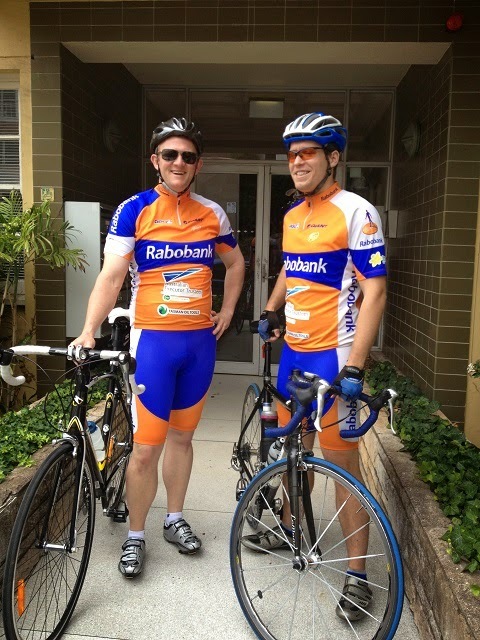 Mark & Tom Tour de France: Cycling, TV and Australia: a happy combination. As we explained in our blog post the other day, watching a major event like the Tour de France on television is really not the same as being there. And whilst we hope to be given the opportunity to report from Le Tour this year, and provide a taste of what it's like to be in France during the largest annual sporting event in the world, we also want to acknowledge and celebrate some of the high quality cycling coverage we already enjoy here in Australia. Naturally we include the coverage from CyclingTips in this category, but since shameless flattery is not really our modus operandi we will refrain from gushing and fawning over their fine publication. Instead, our focus today will be on another media outlet, one whose commitment to cycling over the years has taken many of us on the journey from recreational cyclist to sleep-deprived francophile over the course of three weeks in July. The organisation we are referring to is of course SBS, who for the past 24 years have been broadcasting the Tour de France to Australian television audiences. Over the years, SBS has added other major cycling events to their coverage, such as Paris Roubaix and the World Championships, but in 2014, for the first time ever they broadcast every single stage of the Giro d'Italia live, both on TV and over the internet. I'm sure we're not alone in thinking that's a pretty awesome thing for Australian cycling. Stage 2: Australian Michael Matthews (Orica-GreenEDGE) moves into the overall race lead, whilst his team leads the teams classification. Stage 5: Matthews still in the Maglia Rosa, fellow Australian Cadel Evans (BMC Racing) finishes 2nd on the stage. Stage 6: Matthews wins the stage with Evans coming in 3rd. As well as the pink and white jerseys, Matthews also moves into the lead on the King of the Mountains classification. Stage 7: Matthews retains his lead in the pink, blue and white jerseys. Stage 8: Matthews relinquishes the overall lead to fellow Australian, Evans. Stage 11: Australian Michael Rogers (Tinkoff Bank - Saxo Bank) wins his first ever Grand Tour stage, whilst Evans retains the overall lead. Stage 20: Rogers wins his second Grand Tour stage. For more than half the stages in the race this year, either an Australian was wearing the Maglia Rosa at the end of the day or an Australian won the stage. Or both. Now of course we're not saying that SBS's decision to televise the Giro this year caused the Australian athletes to perform so well, but we're willing to bet that the race results have given their ratings a decent boost. We also want to take this opportunity to strongly encourage the bigwigs at SBS to screen the Vuelta a España this year too. Sure, it probably won't be good for national productivity if Aussie cycling fans now go without sleep in May, July and September, but the long-term benefits of more people watching cycling, and then ultimately participating in cycling for sport, recreation and transport, will be immeasurable. Let's make it happen!